A sumptuous black velvet gothic corset bodice top from Dark Star. The front and back are made from soft velvet with a purple silky panel at the front covered with black lace and metal eyelet and soft cord corset lacing. The long see-through chiffon sleeves have flared cuffs and two long lace-edged chiffon extensions. This top is quite short in the body so can be worn over a vest top or camisole if desired. 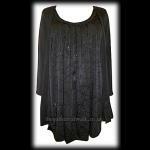 Length to longest point at front: 24"
Plus Size Black Velvet Gothic Bodice Top with Purple Silk & La..